PMTS.org • View topic - Intuition Pro Tongue Liners - should I get them? Intuition Pro Tongue Liners - should I get them? I’ve been skiing a Head S11 boot, with custom footbed having substantial heel lift (limited dorsiflexion) and arch support (metatarsalgia). I have wide feet, 4E. The boots have always been very tight and fairly uncomfortable, both forefoot and top of instep squeeze, but have gotten more comfortable over time. A heel issue developed a couple years ago. I had the boots ground/punched, reducing the boot's bulge over the heel, and the heel pain went away. However, I’ve noticed a little lifting of my heel and rubbing when getting forward or (limitted) hiking for turns. This is acceptable when skiing groomed with some moguls and no hiking, but I’m planning on going all-out on mogul improvement this coming winter and I believe the greater fore/aft required is likely to start to tear up the heel unless I can get a firmer heel hold in the boot. E.g., more than a couple attempted dolphin turns is a no-no, the heels rub and start to hurt! I’m thinking about getting Intuition boot liners as a way of improving the heel hold. In bare feet and with toes touching the bootshell there’s about ¾ inch behind the heel. 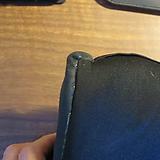 My bare forefoot touches both sides of the boot shell, width fit is tight. Based on the Intuition website, my current medium/tight shell fit, wide feet, high instep, and substantial footbed, the Intuition Pro Tongue is indicated. Because of the tight fit in forefoot and instep, I’m thinking of getting the boots’ forefoot area punched before purchasing and molding the Intuition liners. I’m planning on doing the home fitting, rice and microwave approach as described on the website and with YouTube video’s available. I’ve read thru jbotti’s 1/07/2014 and 2/18/2016 threads, as well as a number of other Intuition Pro Tongue reviews and the Intuition website. Do the Pro Tongue liners make sense? Will they likely enhance heel hold? Do they have too much material to work given the already tight boot fit? Do you see any potential problems with the forefoot boot punch prior to molding the Pro Tongue liners? Can I use my insertable boot dryers (no fan, passive heat) with the Pro Tongues, or might the liners deform? PS. I’d love to get new boots and full-on Harb alignment/fit, but a) I’m in Ohio, and b) I’d like to avoid the cost of new boots at this time. Re: Intuition Pro Tongue Liners - should I get them? 3/4" or 2cm is the the max behind the heel to insure a solid fit. I realize that you have said you can't make it to Colorado and that you don't want to spend the money presently, but most likely the better way to make the heel lift disappear is to go 1cm behind the heel instead of 2cm which means different boots. Having said that your wide foot makes for some significant boot fitting issues. Giving the Pro Tongues a try probably makes sense. They definitely take up space in the ankle area which prevents heel lift and you can buckle them lightly in that area while molding to have them take up more space. The pro tongue has more room in the toe box than most liners and it will be thinner in the forefoot area than the stock liner on the Head S11. Sounds like you need some punching and or grinding in the forefoot no matter but I wouldn't do too much because the pro tongue will be thinner there than your current liner (and you can always do more afterwards). I would recommend not doing the home baking and molding if you can avoid it. Obviously if that's your only choice go at it. The pro tongue will likely be a significant improvement to your boot set up. Unclear if it will fully eliminate the heel lift, but it might especially if you bake them buckled lightly in that area. BTW, make sure to buckle much more tightly around your forefoot where you do not need to take up space. Go quite tight there while molding. You can always re-bake but you lose volume each bake (and you want volume around your heel and ankle). That's why its better to work with someone that does these bake and molds regularly to help you dial in how tight to set things when molding. * All liners get thinner over time. Intuition liners (e.g., Pro Tongue) are made with a better quality cork/foam than stock liners. They are warmer, they hold foot better, and they last longer. I love mine. You cannot go wrong with Intuition. Diana once told me that she thinks that it is worth skiing one season with stock liners to work out bootfitting issues with the shell, and then go to Intuition. It is so much better. * Do you have pronation? A pronating foot gets wider (and longer) when loaded. A proper footbed with pronation correction (wedge built in in postig under the heel or forefoot) may help to keep it narrower when loaded. * As for drying, they are not any different than regular liners in this sense. Moderate heating will not do any harm. Ski boot driers with fan and very weak heater are the best. 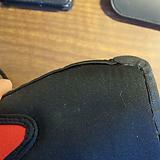 Short term, you can play with padding your existing liners with foam pads to reduce movement of the foot in the shell. Foam compresses quickly, so this solution is temporary at best, but you can get one season out of it. Bootfitting foam (as sheets or precut pads) is available from specialized stores, e.g. Tognar or Race Place. From what I gathered, the cost of getting it done in a shop is the same as ordering them with a do-it-yourself kit. No good reason to do it at home. Not sure if this is relevant for you but I have tried the Pro tongue and they did not work for me simply due to the boots having too much space around the ankle for even the intuition to take up enough space. I did like the firmness of the foam and hope that in a future plug boot they may work. That wasn't my experience. Forward lean was essentially unchanged between my stock (Lange) liners and the Pro Tongues. One suspects this will be boot specific. I think that is correct. Lange race boots (the Z series 92 last and the RS series) are much more upright than the Head race boots (B series and RS line) which have 16 degrees of Fl (vs. 12 degrees on the Langes). The back of the cuff on the Pro Tongues is bigger than on most liners. It makes sense that if your boot has a good amount of FL that thicker cuff will increase it. With less FL it will have less impact. I just tried to ski a Lange ZC with the Pro Tongues and it was massively lacking in FL for me even with 2 spoilers added to the cuff. If the Pro Tongues increased it any it was marginal. I held off posting this for a week or so, as I can’t tell if the attached photos (jpgs) will appear on the website, but given your recent posts, I thought I’d go ahead and post this. The local ski store doesn’t normally keep the Intuition liners in stock’, but were able to order them for me. I decided to have the store do the fitting. The liners came in a week ago and I had them baked and fit. During the fitting it seemed to me that my custom footbed was not fitting snugly to the back of the liner in the right foot liner, although the boot fitter felt that was okay. The positioning of the footbed in the left foot liner seemed okay to me. I brought the liners and boots home and tried them on again, and feel the footbed on the right liner is not where it should be. With my finger I can feel a gap of about 1/16th inch or so between the back of the footbed and the back of the right liner. 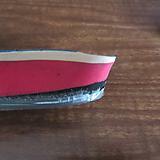 I’ve tried to jam the footbed closer to the back of the liner and it will not stay snugly against the liner. I believe I should have the liner baked and fitted again, making sure that the footbed is jammed snugly to the back of the liner. I’ve attached photos of both the right foot and the left foot liners as well as my right footbed. The back of the right foot liner is clearly scrunched up a bit, whereas the left foot liner looks pretty well stretched out. Last edited by Cleveland on Tue Jan 02, 2018 11:23 am, edited 5 times in total. Can't see the photos, but this doesn't sound right. My footbeds and liners mate with no gaps or scrunching. The liners lose volume with each bake cycle, so it's not clear you should repeat that until someone with real expertise can see the problem and advise. Use of the laces is optional. Using them means going in and out racer style. That was too much hassle for me if I could avoid it... but could I? As ToddW has pointed out, the Pro Tongues can cause hot spots on some skiers' tibias. Sure enough, when I first skied them I developed 1-2" high hot spots. After 3 consecutive days every turn felt like a kick in the shins. After 5 days I was literally bleeding in my boots. I have chicken-skinny shins and ankles. The lack of natural padding makes tongue and cuff fitting difficult without resorting to thicker socks, which deaden boot feel, delay tipping and smear ski responsiveness... not what I bought the Pro Tongues for. To eliminate the hot spots I was afraid I'd have go the laceup route (and join Todd in needing 2 hours to put my boots on every morning ). Happily, I was able to craft a simpler solution... strips of thin bootfitting foam taped to the front of the tongue, one strip on each side, leaving a gap down the centerline to move pressure away from the hot spot. This eliminated the hot spots without softening the interface between legs and liners. If I want a firmer tongue I could replace the bootfitting foam with slices from a plastic milk carton. I now ski the Pro Tongues wearing just very thin silk socks (what most people call sock liners). These are thinner than wool race socks, yet I have perfect cuff contact from ankles to liner tops. There's so little free play that just one lower cuff buckle setting is skiable... one twist too tight and I get "pins and needles" in my feet... one twist too loose and there's a lag in responsiveness. The ideal adjustment provides instantaneous response with no hot spots... and no laces. YMMV of course. Just pointing out that there may be more than one way to achieve an effective fit. DougD wrote: To eliminate the hot spots I was afraid I'd have go the laceup route (and join Todd in needing 2 hours to put my boots on every morning ). As I get older and mellow out, I'm finding that there's no need to rush so much in the morning. I now schedule a leisurely coffee break after fastening each boot. This has become the core of the morning social hour in our ski locker room, so call it 3 hours now. No need to rush ... there'll be snow next year. REALLY sorry to hear about your mishap. Out of control snowboarders (or skiers)... GRRR! Let me know when you're up and skiing. Would love to meet up again. No pressure getting the boots on quicker... I'm not getting any younger either! ToddW wrote: Then I'll get to try out my new playtoy -- a soloshot 3 auto-tracking camera to take MA video of myself and friends skiing. How did that Soloshot3 work out for you? Between the return from injury and an unprecedented run of severe weather, I didn’t get much experience with it. The early models needed a firmware update to track skiers. l2ski has much more experience with the solo shot 3 on snow. If he’s reading, maybe he’ll post a review.